I love this fish. I found it at the City Market in Rachel Taulelei’s fish chiller. Her company Yellow Brick Road has a reputation for great tasting seafood: live oysters, whole flounder, line-caught snapper, all beautifully fresh. The day’s catch was laid out on ice – surf clams, whole terakihi, said fish and a row of pearly white fillets. I had been thinking snapper for lunch but this crazy looking fish stole the show in the cabinet. No contest. I thought it was gorgeous and I had to find out if it tasted as good as it looked. 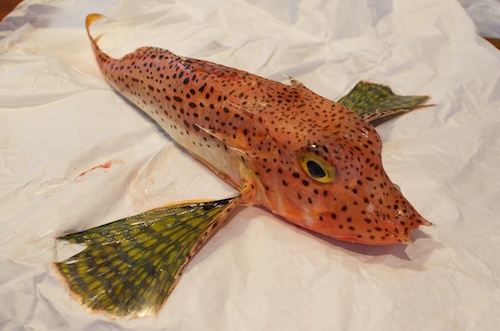 Rachel told me it was a Japanese gurnard – a type not often seen in fish shops – and she very kindly gave it to me. I took it home and had a hell of a job filleting it. Its skin was almost impenetrable, its head armour-plated and the spines on its back (lying flat in my photo) were dangerously sharp. But the flesh – once I’d got to it – was beautifully textured. It was silky but firm and whiter than the common gurnard I’m used to. When it comes to cooking fish, I’m a purist. A delicate white fish like gurnard needs very little flavouring. I panfried the fillets in butter and made a beurre blanc sauce – part of the classic repertoire I’ve been practicing at Le Cordon Bleu in Wellington (more of that later). It was excellent. As Al Brown would say, it ate very well. So keep an eye out for this fish, you can’t miss it. Place diced shallot, wine, vinegar, peppercorns and bayleaf in a small saucepan over medium heat and reduce to about 3 tablespoons. Strain off solids and pour liquid back into saucepan. Place back on heat and whisk in cream then butter, one cube at a time, until you have a slightly thickened sauce. Add salt to taste and a pinch of cayenne. Remove from heat but keep warm. Season fillets with salt then dust in a little flour. Heat oil in frypan and fry on both sides until flesh is just cooked through. 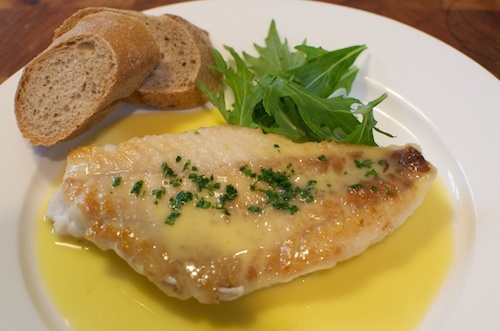 Squeeze lemon juice over the top of each fillet and serve on warm plates with sauce and a scattering of parsley.